In late March, former Los Angeles mayor Antonio Villaraigosa polled in a disappointing third place in the race to become California’s next governor. The Democrat had fallen behind pro-Trump Republican businessman John Cox of San Diego County, a long shot who’s never been elected to public office and who only moved to the state from Chicago 10 years ago. Democrat Gavin Newsom, the California lieutenant governor and former San Francisco mayor, was the clear frontrunner. In that poll, conducted by the Public Policy Institute of California, Newsom got the nod from 28 percent of respondents, while Cox and Villaraigosa got 14 and 12 percent, respectively; 10 percent of the 1,706 respondents were pulling for Republican state assemblyman Travis Allen. Only the top two finishers in the June 5 primary will move on to compete in the general election, so a third-place showing would mean the end of the road for Villaraigosa. But Netflix CEO Reed Hastings came to the rescue, donating a season-high $7 million to Families & Teachers for Antonio Villaraigosa for Governor 2018, an independent committee run by the California Charter Schools Association Advocates, which supports Villaraigosa. Hastings’s whopping donation to the pro-Villaraigosa committee is more than double the $5.8 million that the Villaraigosa campaign had in its war chest at the end of December. The nonpartisan Fair Political Practices Commission called it the largest contribution made on behalf of any candidate or initiative thus far this election season. And it kick-started what election observers say is the largest cash infusion in the history of California politics. The reason for the donation? Villaraigosa is a longtime charter-school proponent with a record of opposing teachers unions and even elected school boards. Other billionaire charter-school advocates have followed suit—and the money is reshaping the race for governor. By mid-May, philanthropist Eli Broad and former New York City Mayor Michael Bloomberg had each donated $2.5 million to the same PAC as Hastings, according to the L.A. Times. Hedge fund manager Bill Oberndorf, a major Republican donor who succeeded Betsy DeVos as chairman of the American Federation for Children after President Trump named DeVos education secretary, has contributed $2 million. Walmart heiress and charter school backer Alice L. Walton contributed $750,000 and former Republican mayor of Los Angeles Richard Riordan donated $1 million. Within a month, wealthy charter advocates wiped out Newsom’s fundraising lead. 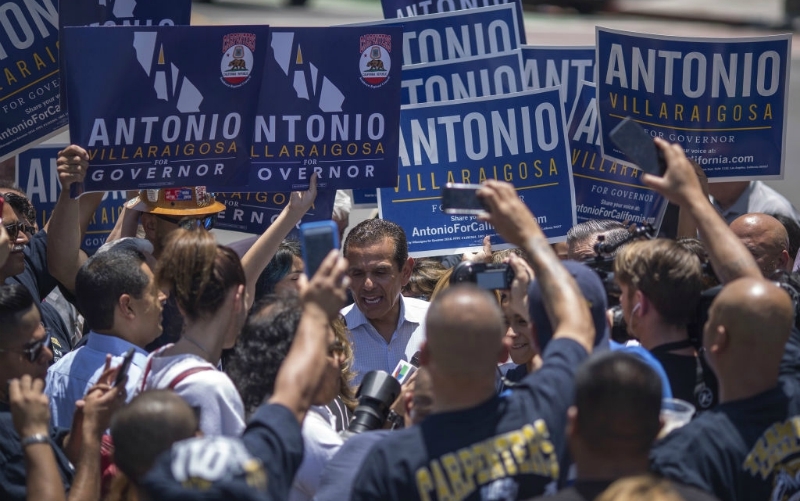 The Los Angeles Times reported that 61 percent of Villaraigosa’s funds have been raised by groups outside the candidate’s campaign, compared to 21 percent for Newsom and 2 percent for Cox. Villaraigosa, a teachers union organizer in his youth, became a union critic after he was elected mayor in 2005, calling the union “the loudest opponent and the largest obstacle to creating quality schools.” During his time in City Hall, Villaraigosa tried unsuccessfully to take over the Los Angeles Unified School District, proposing to replace the elected school board with a council composed of himself and the leaders of smaller cities that are part of the school district. He later formed a nonprofit that took control of 18 low-performing schools in the district. For his part, Newsom supported the growth of charters when he was San Francisco’s mayor. As a gubernatorial candidate, however, he has drawn closer to teachers’ unions. The powerful California Teachers Association has donated $1,082,159 to his campaign. In May, the California School Employees Association donated $250,000 to an independent expenditure committee supporting Newsom; the California Federation of Teachers donated $25,000 to the committee, and $58,400 in direct contributions to Newsom’s campaign. Newsom has won broad support from organized labor in the state, garnering more union endorsements than any candidate in the race. Hastings, a former member of California’s State Board of Education appointed by then-governor Gray Davis, has long been among the most prominent advocates for charter-school expansion in California. In 1998, Hastings, who lives in Santa Cruz, led a Silicon Valley alliance that collected more than a million signatures to qualify a ballot initiative to lift California’s charter cap. He used the initiative as leverage, eventually convincing charter school critics within the state assembly to agree to legislation that would accomplish what he wanted without the initiative. Villaraigosa, then the assembly’s rookie speaker, helped broker the deal. In 1998, there were 134 charters in California. By 2003, 473 schools had obtained charters. In 2016, the California Department of Education reported about 982 charters, enrolling around 600,000 students, or nearly 10 percent of the total student enrollment. L.A. Unified, the nation’s second-largest school district, has more charters than any district in the country, and the CCSA says it is poised for continued growth. In 2015, Hastings donated $1.5 million to a political action committee that supported pro-charter candidates including Ref Rodriguez in his successful bid for school board. After prosecutors filed campaign finance charges against Rodriguez last year, Hastings donated $75,000 to a legal defense fund for the embattled board member. “I’m supporting his legal defense fund to ensure he gets the fair hearing that everyone deserves,” Hastings wrote in an email to the L.A. Times. According to the L.A. Times, Hastings donated nearly $7 million last year to the advocacy arm of the California Charter Schools Association in support of the successful L.A. school board campaigns of candidates Nick Melvoin and Kelly Gonez and incumbent Mónica García. It’s considered to be the most expensive school board race in U.S. history by more than 50 percent and brought about a pro-charter-school majority on the board for the first time. Despite those donations, Hastings has argued that elected school boards are a major impediment to a far-reaching school-reform agenda. He’s also said that elected school boards tend to introduce instability in leadership and has spoken in favor of self-appointed, self-perpetuating school boards modeled on nonprofit organizations. Hastings outlined his aggressive vision for expanding charters to 90 percent of state enrollment in an address to a California Charter Schools Association conference in 2014. Among the ranks of large political contributions from charter advocates in recent years, Hastings has stood above the rest. How much more will Hastings donate before he is finished? Borden of CCSAA politely declined to answer the question. RELATED: Could Straight-Talking City Councilman Herb Wesson Be L.A.’s Next Mayor? Previous articleThe Hammer Museum Is Tapping Into Local Talent with Made in L.A.
Next articleWhat Ever Happened to Alan Smithee, Hollywood’s Worst Director?